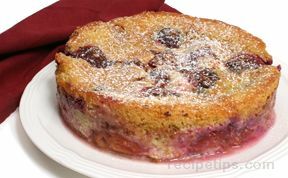 A pretty and very easy dessert using plums, pluots or peaches. Cream together the butter and sugar; add the eggs and beat until well mixed. Thoroughly blend in the flour, baking powder, salt and pepper. Spoon batter into a 9 inch springform pan. 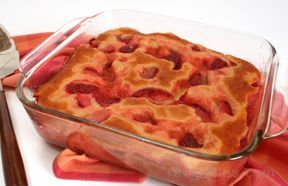 Peel fruit and place on top of the batter. You may have to have two layers of fruit to get them all to fit. Set aside. 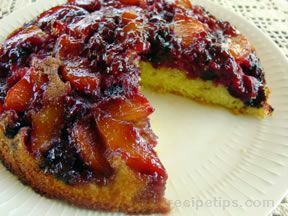 Sprinkle evenly over fruit, then drizzle with lemon juice. Cool slightly, then remove from pan. Sprinkle lightly with powdered sugar. 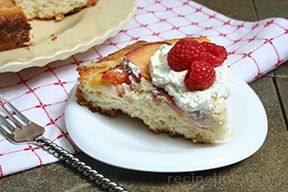 Serve warm with vanilla ice cream or whipped cream.